Alfresco is configured by default to use HTTPs in port 8443 to serve SOLR indexing requests. In order to identify this request, authentication is wanted for this SSL communication. If you are using Alfresco default installer, your running SSL certificates are the same as any other developer using this method, because of they are distributed with Alfresco itself. A repo certificate for Alfresco Repo and a client certificate for SOLR web application must be generated and they have to be included in keystores and truststores to build a confident relation between Alfresco and SOLR web apps. Once configured, the execution of this script will update Alfresco configuration to include your own SSL certificates, both Alfresco and SOLR sides. However if you need to provide qualified electronic certificates for SSL, you will need to include some external certificates issued by an external CA. The simplest is to rename that issued certificates as ssl.repo.crt for Alfresco side and ssl.repo.client.crt for SOLR side and then copy both them to CERTIFICATE_HOME folder set in generate_keystores.sh script. After that, comment or remove any line starting with "$JAVA_HOME/bin/keytool" and execute the script. Your Alfresco installation will have been updated to use your certificates provided by the external CA. However, if you decide to build your own truststore and keystore for Alfresco and SOLR web applications, some other work is required. 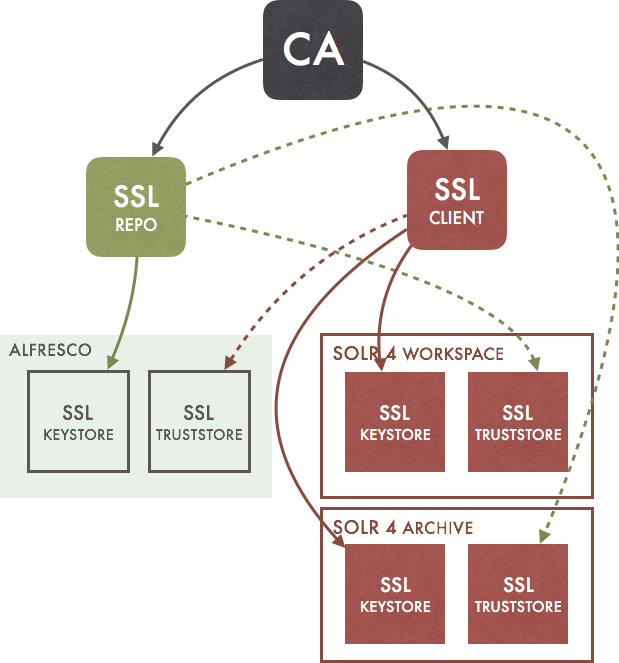 Copy the repo stores (ssl.keystore and ssl.truststore) to /opt/alfresco/alf_data/keystore folder and both client stores (ssl.repo.client.keystore and ssl.repo.client.truststore) to /opt/alfresco/solr4/archive-SpacesStore/conf and opt/alfresco-5.1.f/solr4/workspace-SpacesStore/conf. Just replace kT9X6oe68t for your selected password in every file. From this point your Alfresco installation will use the new certificates for SSL connections. 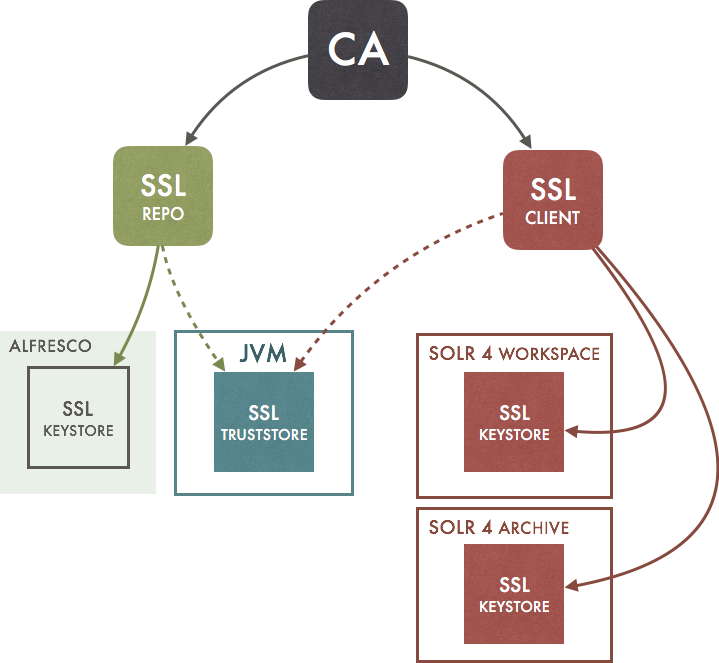 As the JVM itself includes its own truststore, usually located at java/lib/security/cacerts with password changeit, Alfresco truststores (ssl.truststore and ssl.repo.client.truststore) can be ignored. Just importing both certificates in JVM cacerts file and configuring the keystores as described above, Alfresco will run properly with your new keys. In fact, including certificates itself in JVM Truststore is not required at all. It should be enough by including issuer certificate, that is, the public part of the certificate of the CA which was issuing that SSL repo and SSL client certificates. So the figure can be expressed as follows. This cacerts store can be used also to import any other SSL certificates, as LDAP ones. Axel Faust shared a customized script to generate this keys and to update Alfresco keystores and truststores according to that simplified scheme. However, both two methods described above are not recommended for production environments, because installing a Web Server in front of Apache Tomcat provides more control an easier administering tasks. Detailed configuration by using Let’s Encrypt CA is available at keensoft blog. Also Alfresco documentation provides instructions to configure an SSL environment for production environments. In this scenario, as SOLR is not reachable from the outside, SSL can be removed from Tomcat, avoiding the overhead produced by cyphering communications between Alfresco and SOLR and improving system performance. There are different options to configure SSL communications in Alfresco, but using default installation resources will produce risks in your system. Choose any of this alternatives and provide a safer platform to your users.